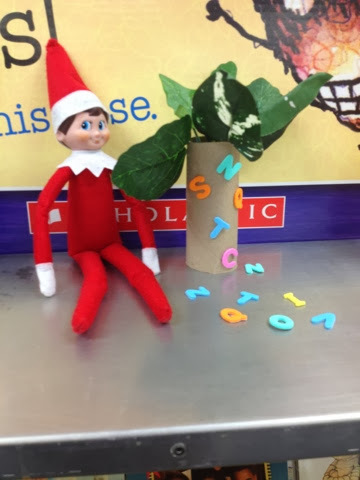 The "Elf on a Shelf" craze has hit my library! I had a brainstorm over Thankgiving break to get an elf for my library. I wanted to tie his poses into reading somehow so I decided to have him pose with parts of books from our library. And then I had another crazy idea to make a contest out of it. I'm not sure what I have gotten myself into as I am not the most creative person when it comes to crafts and making things but here is what "Seuss" has been up to in my library. On Monday when I came in here is what we found. 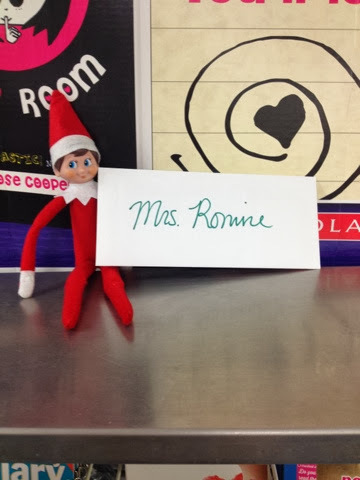 I read the note, which was a poem telling about the elf and why he was there, on the announcements that morning. Seuss told us he was here to play a game with us and that every night before he went to sleep he would read a book in our library and then leave us clues to what the book was. If we guessed all the books by the end of winter break he would be able to come back next year. 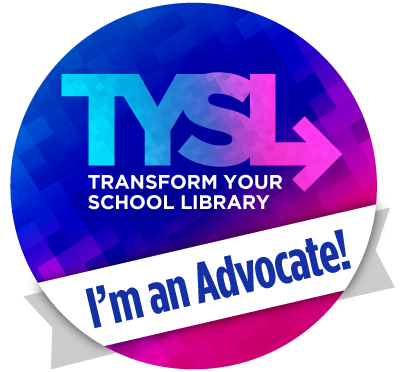 I told the kids that I was going to need their help and to check my library webpage for more details. On Tuesday, this is what we found. I had about 55 kids submit guesses for what book Seuss had read Monday night. Today here is what clue we found. The kids have been really excited each day o see what Seuss has done (even the 4th and 5th graders). I did ask the teachers for some specific items I might need for later books. As I said, I am not so gifted in the creativity department and 12 more scenes is stressing me out a bit, but we'll see what Seuss comes up with. Thanks Laurie! It's been fun, but I am about out of ideas. Haha.